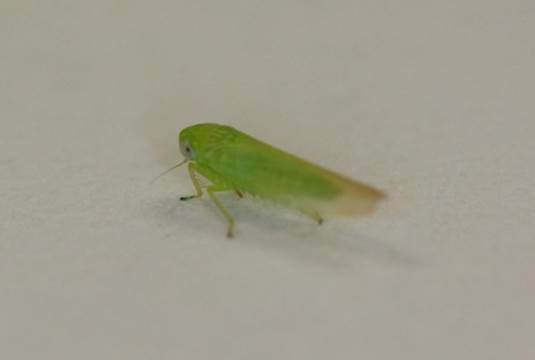 UGA Peanut Entomology | 27 July Peanut Insect Update: Potato leaf hoppers etc. Insect activity is beginning to pick up in some of our Georgia peanut fields, and now is a really good time for growers who may not have a consultant or scout to get out and walk the crop. I have seen a mixed bag of caterpillars in my research plots and in commercial fields this week. Corn earworm larvae were easy to find in one of my trials near a corn field that is drying down. I also saw soybean loopers, velvetbean caterpillars, beet armyworms and yellowstriped armyworms. This sort of information usually leads to questions of what is the best product to spray to control these pests. This is where scouting can save a grower a lot of money. Treating populations that are not at threshold (4 to 8 caterpillars per row foot depending on the condition of the vines) provides NO return on investment. Likewise selecting an insecticide without knowing what species are present can result in costly mistakes. UGA county Extension agents can help growers select the best product(s) to use when thresholds are reached. While caterpillar populations are picking up in some fields, most of the calls I received this week were about potato leafhopper. 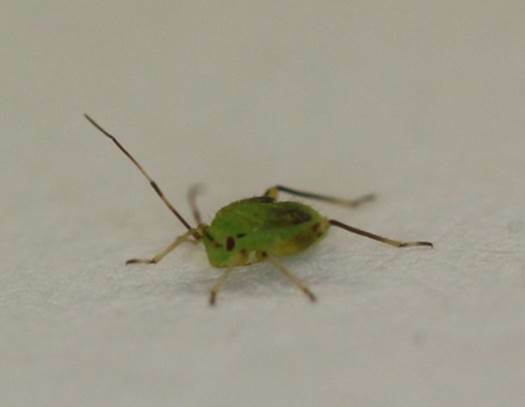 This tiny green insect feeds on leaves which results in the yellowing of leaf tips that we refer to as “hopper burn”. No one likes to see peanuts turn yellow in July or August, but potato leaf hoppers often go undetected until hopper burn is widespread across a field. While there is no economic threshold to guide treatment decisions, we need to make sure the insect is still present in a field before spending the money on an insecticide application. The hopper burn will remain long after the insects have left the field, and more than one Georgia peanut field has been sprayed for potato leafhopper when the pest was long gone. Potato leafhopper infestations generally begin at field borders, so hopper burn at the edge of a field is an early warning sign of a developing problem. 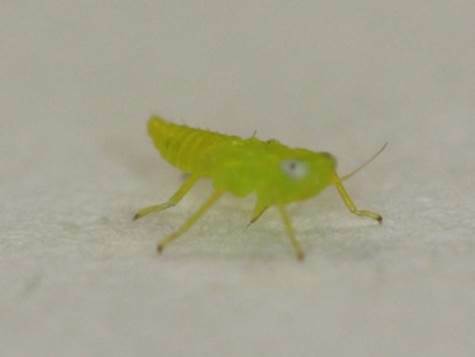 Potato leafhopper nymph. Note that nymphs do not have functional wings. I ran a sweep net through one of my thrips trials yesterday after rating TSWV just to see what was there. In ten sweeps down one row I collected 34 potato leaf hopper adults and nymphs, 132 garden flea hopper adults and nymphs, 5 three cornered alfalfa hoppers and 6 caterpillars. While there was no obvious hopper burn in this field yet, there was some faint yellowing that will likely progress over the coming days. Though I have been seeing a lot of garden fleahoppers lately, numbers this high were a bit of a surprise. There was no visible stippling of the leaves, and this insect tends to stay lower in the canopy and on the underside of leaves. Bryce Sutherland (Worth County UGA ANR Agent) and I tested several products last season for efficacy against garden flea hopper. Acephate was the only active ingredient we tested that significantly reduced garden flea hopper numbers compared to the untreated check. A pyrethroid application resulted in a 6 fold INCREASE in the number of adults compared to the untreated check. Adult garden fleahopper from the rear. Note enlarged femur on hind legs. For additional information about insect management in peanut, contact your local UGA County Extension agent. Garden fleahopper nymph. Note long antennae and wing pads. Posted in Caterpillars, Garden fleahopper, General pest update, Potato leafhooper, Uncategorized. Bookmark the permalink. Previous: It has been quiet; don’t fall asleep!